Unlike other manufacturers who looked vigorous rolling fleet of new TV product, after nearly inaudible for some time, slowly but surely Philips has just rolled out a fleet reportedly TV Full HD newest product is the T-line. TV with 221TE2LB model has a 21.5-inch screen sizes. And this is the form factor standard for mainstream users on the move. The use of TN panels and the W-LED backlighting will certainly worthy of display color gamut and brightness of 250 cd/m2. Since this TV is built with LED technology, will certainly offer a reasonable power efficiency for its users. Moreover, Philips is also presenting a fairly feature SmartContrast ratio and dynamic contrast for 20.000.000:1 with only a 5ms response time alone. To deliver crystal clear sound quality, Philips has also provided a pair of 3W speakers for stereo sound. Digital TV is also equipped with a D-Sub and HDMI inputs (plus S-Video and SCART ports) to deliver optimum entertainment. As the status of Full HD and dibesut with a native resolution of 1920 × 1080 pixels, Philip Full HD TV T-New Line is able to present a more clear and real. 221TE2LB Philips seems to have everything you need to go into the second category of both the monitor and TV. For the European market, Philips Full HD TV T-Lineini priced 217 Euros, or about 2.68 million per unit. 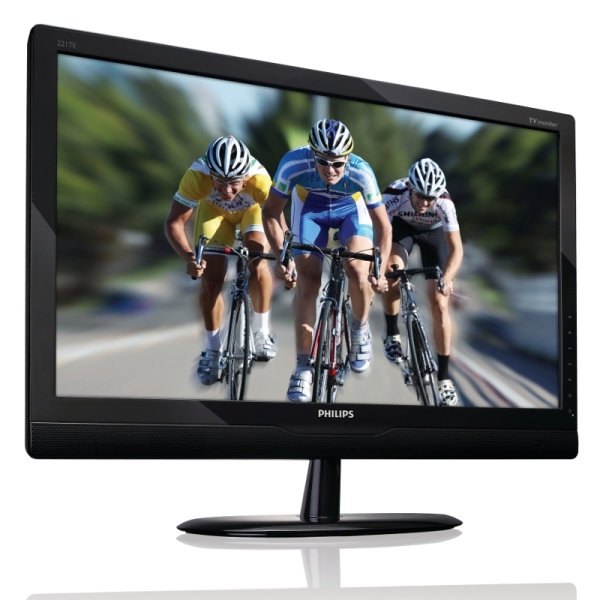 And all the information about the Full HD TV can be found on the product page on the official website of Philip.